Why is jurisdiction in Indian country like playing a game of Twister? This resource guide will serve as the “tour guide,” directing the reader down the path of the evolution of jurisdiction in Indian country. The book’s presentation gives its reader a broad perspective, beginning with the indigenous sovereign nations and following the historical twists and turns that have created the puzzling tribal, federal and state jurisdictions that exist today in Indian country. 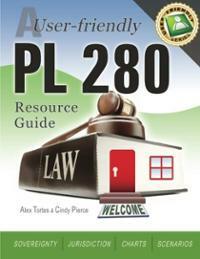 PL 280 was the legal vehicle which allowed the federal government to transfer certain jurisdiction to the states. This transfer of jurisdiction, especially criminal jurisdiction, has created a multitude of issues. Both Native Americans and the myriad of individuals who work or interact within tribal communities have been forced to make sense of this convoluted law. The goal of A User-friendly PL 280 Resource Guide is to take the mystery out of PL 280 and help the reader unravel the tangled jurisdictional maze that is seen in Indian country today. Although PL 280 became a law over a half a century ago, it has managed to remain elusive. No more hiding in the shadows or being camouflaged in highbrowed legalese! Let’s grab PL 280 by the collar and confront it face-to-face. The book’s distinctive style and easy-to-understand format, along with its fun illustrations and charts, make for enjoyable learning. It features interesting icon navigation. There are a multiple states, counties, cities, and tribes that are interested in implementing “Swift, Certain, and Fair” (SCF) models of supervision with offenders in the community. This interest has grown out of the potential promise that these SCF models have shown in effectively reducing recidivism and preventing crime. In particular, Hawaii’s Opportunity Probation with Enforcement (HOPE) program has been shown to have promise, and as a result there is significant interest and activity in implementing models of supervision and other versions of the HOPE model which rely on swift, certain, and fair sanctions to improve the outcomes of individuals under community supervision.SCF approaches are intended to: (a) improve supervision strategies that reduce recidivism; (b) promote and increase collaboration among agencies and officials who work in community corrections and related fields to enhance swift and certain sanctions; (c) enhance the offenders’ perception that the supervision decisions are fair, consistently applied, and consequences are transparent; and (d) improve the outcomes of individuals participating in these initiatives. Through this FY 2015 grant announcement, BJA will select multiple applicants to implement or enhance a HOPE model using SCF. Applicants selected under this announcement will work with BJA and its SCF training and technical assistance (TTA) partner to implement the model with fidelity.BJA is supporting this effort to enhance public safety, foster collaboration, and improve the outcomes of individuals under the supervision of community corrections. Current Closing Date for Applications: March 09, 2015. An update on the Indian Law and Order Commission activities provided during the 2013 NAICJA Conference. The Tribal Law & Order Act helps to address crime in tribal communities and places a strong emphasis on decreasing violence against American Indian and Alaska Native women. The Act encourages the hiring of more law enforcement officers for Indian lands and provides additional tools to address critical public safety needs. The U.S. Department of Justice (DOJ) and the U.S.Department of Interior (DOI), in conjunction with the Tribal Justice Plan Implementation Work Group (Work Group), developed and is implementing the Long Term Plan to Build and Enhance Tribal Justice Systems (Tribal Justice Plan), a congressionally mandated report described in the Tribal Law and Order Act (TLOA). The Indian Law and Order Commission is pleased to transmit its final report and recommendations—A Roadmap For Making Native America Safer—as required by the Tribal Law and Order Act of 2010, Public Law 111-211 (TLOA). These recommendations are intended to make Native American and Alaska Native nations safer and more just for all U.S. citizens and to reduce the unacceptably high rates of violent crime that have plagued Indian country for decades. This report reflects one of the most comprehensive assessments ever undertaken of criminal justice systems servicing Native American and Alaska Native communities.